Heading into the OHL playoffs, the ideal matchup in the Western Conference was the Erie Otters taking on the London Knights. To set the stage, you’d have two 105-point teams from the regular season that went down to the final game of the regular season to decide the top seed in the conference. Both teams were near the top of the league in scoring – the Knights having led the way – and both teams sported lineups full of talented young players who were looking to showcase their skills in the hopes of landing a spot in the league final. While the offence on both teams is top-notch, the expectation was that this series would be a close one with either goaltender finding a way to steal a game or two – and it still should be. But Game 1 on Wednesday night in Erie was anything but close as the Knights managed to take advantage of their opportunities winning 7-4 to take a 1-0 series lead. From a Knights perspective, it seems like a pretty solid game. So what can London take away from their Game 1 win over the Otters? 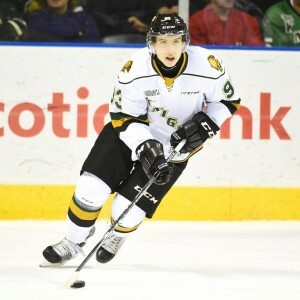 Mitch Marner. Matthew Tkachuk. Christian Dvorak. While the Knights have depth far past these three names, they remain the pillars of this franchise – at least for the remainder of this season. And so, the spotlight tends to fall on these three players. With that comes a major responsibility. For the 20-year-old Dvorak and his two 18-year-old comrades, the responsibility isn’t affecting their game in any way. In fact, through 11 playoff games, the trio are all ranked in the top four in scoring. The most foolish line in hockey right now… Marner, Dvorak, Tkachuk. Marner has 29 points (11g-18a), with Tkachuk right behind him with 26 points (13g-13a) and Dvorak rounding out the top four with 21 points (8g-13a) in those 11 games. And they didn’t let up in Game 1 of the Western Conference Finals against Erie. The three combined for 13 points (6g-7a) in the team’s seven-goal performance in the series opener on Wednesday night – leading their Knights to the Game 1 win. They accounted for 14 of the team’s 26 shots and made it well-known why they’re considered the offensive leaders of this team. While the Knights will certainly need help from their depth players to accomplish what they’ve set out to do this postseason, the ability to dominate a game the way their top trio did in Game 1 is exactly what the Knights expected from these three players heading into such a highly anticipated series like the Erie-London matchup. As of right now, it seems Dvorak, Marner and Tkachuk are poised to take advantage of their opportunities and exhibit the skill that’ve made them all into top end NHL prospects. Like any game, special teams can play a major role in deciding who takes home the crown. The same thing can be said for the Knights’ Game 1 performance. London took advantage of four first period penalties by the Otters scoring on three of their four powerplays during the period and finishing the game three-for-four with the man advantage. They dominated their powerplays and maintained significant zone time leading to their three goal lead following the first period. On top of that, the Knights took just one penalty late in the first period – the only one of the game – and managed to hold off the powerful Erie powerplay. That was something the Knights struggled with in the regular season against the Otters – taking far too many penalties. With the combination of a successful powerplay and the ability to stay out of the box, the Knights were able to take the battle of special teams in Game 1. If they have any hope of moving on to the OHL Finals, it’ll take the same effort for the remainder of the series. Up 5-1 about six minutes into the second period, Erie’s DeBrincat got in close to the London net and netted the Otters’ second goal of the game. Twelve minutes later, DeBrincat scored again. The Knights added an insurance goal almost eight minutes into the third before DeBrincat fired home his third of the game two minutes later. Sure, the Knights were able to notch seven goals but it was the final three goals by the Otters that London needs to shut the door on. By letting up slightly, the Knights were outshot in the second and third combined 22-13 and it showed. London can’t allow Erie to develop any momentum with players like Strome, DeBrincat and Maksimovich waiting to break out. That being said, the Knights can take more positives away from this game than negatives. But there’s always something that can be improved and the Knights have to find a way to close out games and not let up one bit. Either way, this series is set up to provide the OHL with what could likely be the top contender in the finals and a solid addition to this year’s Memorial Cup.